Is gardening your hobby or more than just a hobby? Are you the person who would like to grow your own stock of fresh veggies? If yes, then you would definitely love, appreciate and buy the Kitchen Garden magazine, edition after edition. Buy a single copy or subscription to Kitchen Garden magazine. For all those people who adore kitchen gardening, this magazine has a lot to offer. Kitchen Garden is a popular magazine which talks about the various aspects of gardening. 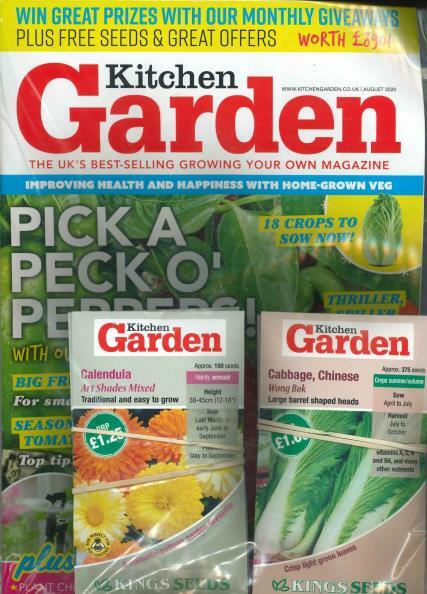 This magazine is a great treat for all those readers who love gardening and wish to grow vegetables in their garden. Each edition focuses on various aspects of horticulture and gardening which will help kitchen gardeners not just learn new skills but also improve skills. So, whether you are growing vegetables on a patch of land in the balcony or in the patio, you have access to your own vegetables. There is no better thing than to see your own garden grow with some nutritious and healthy vegetables. Readers can avail latest news on kitchen gardening and learn newer techniques in that field by subscribing. A yearly subscription is going to be a good money saver for the reader who can also avail uninterrupted supply of this magazine. The magazine in published 12 times a year and is quite frenzy not just in Great Britain but also in other parts of the world. Being a kitchen gardener is not just a hobby, but a pleasant experience for many. So, for all those organic food lovers and vegans this magazine is a great way of starting up. So, all those happy kitchen gardeners it is time to pick up the shovel and the spade and get the land patch ready for some action. For this, subscribe for the magazine. Well laaid out, easy to read. Like thenway it focuses on the month it is done. Helpful, interesting, useful, can relate it to my allotment. Learn loads from it. MY FATHER REALLY LIKES THIS MAGAZINE I HOPE HE WILL ALLOW ME TO READ EACH ISSUE AFTER HIM! I have an allotment and find this magazine inspirational, enjoyable and factual - look forward to its arrival each month!